In each of about 80 Conferences, there are now 4 helmets left to battle for the final contest to determine the Helmet Bowl Conference Champions. Remember, the 64 Conference Champions with the most votes through Conference play qualify for the Helmet Bowl II National Championship. 22 Conference Champions from Helmet Bowl I – including two National Quarter Finalists from last year – bowed out this past week. Their Conference Championship in the inaugural Helmet Bowl will never be taken away, but they will not repeat nor reign as undefeated Champions. In the Great Plains Athletic Conference, the Concordia (NE) Bulldogs fell to the Doane Tigers. Though there are four helmets competing now for the Championship Crown, only two (in our view) should have a shot. The Georgetown College Tigers make way for the Bluefield College Ramblin' Rams in the Mid-South. Ohio State, sporting the same helmet that won the Big Ten last year, falls to an attractive, yet representative helmet by the Indiana Hoosiers. The Southern Miss Golden Eagles, under the direction of Assistant Equipment Manager Harley Warren, present the most helmet variations through the Helmet Bowl life. This week, Harley sent an American flag inspired Golden Eagle head on a dark helmet. 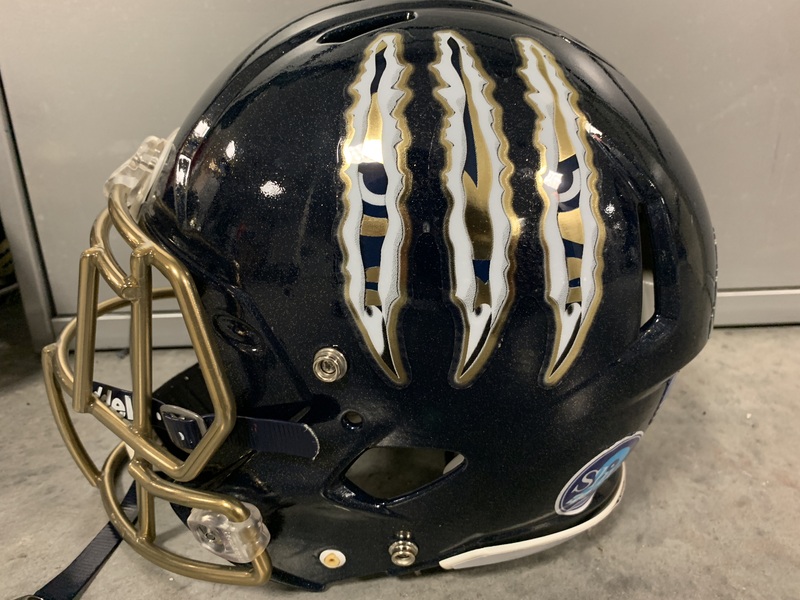 Then, Florida International forced us to rewrite the rules, allowing as many helmet variations as the Equipment team wanted, and sent us a Monster energy inspired claw-marked black helmet with the Panther eyes peaking out of the claw marks. Astonishingly, Southern Miss relinquishes the Conference USA crown. The Buffalo Bulls (it is nearly impossible to type the word “Bulls” after typing Buffalo without going back and changing it from “Bills”) defeat Helmet Bowl I National quarter finalist Central Michigan Chippewas with an attractive shiny angry bull head on a matte blue helmet. They advance in the MAC. This is crazy. The candy-apple red helmet of San Diego State, embossed with the Aztec calendar in black, goes down in defeat to Boise State in the Mountain West. It's not that the Broncos' angry horse head with the red (orange?) piercing eye isn't attractive – it is a great helmet – it's that the Aztecs made a strong challenge for the Helmet Bowl I National Championship, losing in a stunner on the last day to Gallaudet. Wow. The Phoenix of Elon sport a red dragon in the shape (sort of) of an E. Their Colonial Athletic defense ends at the hands of the Dukes of James Madison who present a gold chrome JMU on the side and gold and purple strip down the middle of a white helmet. The Butler Bulldogs fall to a nice red helmet with a uniquely treated block D in white and black for the Davidson Wildcats in the Pioneer League. The Stephen F Austin Lumberjacks, who oddly enough don't announce their lumberjackness on their helmet, fall to a roaring purple bear head on a Central Arkansas Bears white helmet in the strong Southland Conference. Though the prowling Bowie State Bulldog on the black helmet won the Central Intercollegiate a year ago, the yellow-clawed red helmet of the Shaw Bears handily won this week. Will anyone challenge them (We're talking to you Saint Augustine Falcons) for the Championship? The stylized dark W of the Wayne State Warriors gold helmet with the green fade from the bottom up, lost (somehow) to the dark Grand Valley State Lakers helmet with the simple GV on the side in the Great Lakes Intercollegiate. The sword-crossed Battlers of Alderson-Broaddus in the Great Midwest Athletic lost to the orange derrick splitting the U and F on the Findlay Oilers lid. BTW, the GMAC has a nice collection of unique helmets. The green helmet of the Eastern New Mexico Greyhounds with the grey capital E lost to the purple capital T over the state of Texas worn by the Tarleton State Texans in the Lone Star. The Minnesota Duluth Bulldogs wont he Northern Sun last year, but were eliminated this year in Round 2 by the angry Viking apparently in a windstorm on the helmet of Augustana! The capital L and R in white on the red helmet of the Lenoir-Ryne Bears was defeated by the flying fleur-de-lis on a pleasing blue of the Limestone Saints (hailing from Gaffney, S.C.) in the South Atlantic. The orange lid of the Louisiana College Wildcats was upended in the American Southwest by the honeycomb-striped black Howard Payne helmet with a Yellow Jacket and HPU on the cutout of Texas. Illinois Wesleyan were dethroned by the Carroll Pioneers. The Titans ruled the Conference of Illinois and Wisconsin with a green helmet and large grey W. The Pioneers continue their campaign with the Chicago Bears-inspired C on an orange lid. In the Northern Athletics, the Eureka Red Devils defeat the Concordia Chicago Cougars. How do you represent the Blue Streaks of John Carroll in the Ohio Athletic? Their choice is a gold helmet and it lost to the wind-blown armored head of the Heidelberg Student Princes. The Bethany Bison sport a green helmet with a white decal of a charging (?) bison. They lost the Presidents Athletic crown by dropping their Round 2 match-up with the Carnegie Mellon Tartans who put a black silhouette of a Scottie named Maggie in a shield on a white helmet. The Greensboro College The Pride fell to the Huntingdon College Hawks in the USA South Athletic. The Hawks sport a triangled black hawk superimposed on a white H on a red helmet. Finally, the defending Independent Conference Champion Army Black Knights drop to the Liberty Flames. Whoa. These helmets made an impression and we are sorry to see them eliminated from Helmet Bowl II. The simple gold diagonal stripe that sets the white top of Eastern Oregon's helmet apart from the dark blue lower portion give the Mountaineers' helmets style. They also use the uniform number on the left side of the helmet – a tribute to each player and to the equipment team at the same time. This helmet was defeated in Round 2 by the Southern Oregon Raiders, sporting an artistic charging bird of prey in black and red against a white helmet. While we have an affinity for Pitt's yellow helmet with the script Pitt for its longevity and representative simplicity, we are sorry to see the Hokies removed from the contest. Yes, another diagonally-styled helmet caught our attention. Better luck next year, Virginia Tech. Kansas and Texas Christian came down to the wire tied. Both helmets present uniqueness, and in similar fashion. Both represent their school mascot with cartoon-ish drawings – a Horned Frog and Jayhawk. Sorry to see the Horned Frogs go. Either way, we see K-State having a challenger in the Big 12. Hard to believe. The Iowa Hawkeyes black helmet with the familiar yellow Hawkeye head defeated one of the most attractive helmets in the contest: the Maryland flag draped helmet of the Terrapins. When the Maryland campus wakes up to Helmet Bowl, this helmet will be difficult to defeat in the future. We hate to see either helmet in defeat this week in the Central Intercollegiate. Saint Augustine presents an attractive silver chrome feather bonnet for the win against the muscled Bull (Golden?) of Johnson C Smith. Sorry to see the Catawba Indians helmet no longer in this competition, though the silver howling wolf sillouette in the red capital N on the white Newberry Wolves helmet is a contender now for the South Atlantic.